France has been particularly affected by a major outbreak of measles in Europe, which WHO blames on a failure to vaccinate all children against the illness. 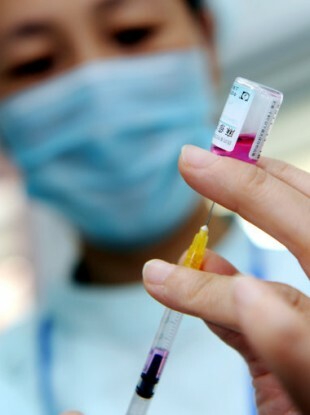 File photo of a medical worker preparing an injection of a measles vaccine. EUROPE, ESPECIALLY FRANCE, has been hit by a measles outbreak, which the UN health agency WHO is blaming on the failure to vaccinate all children. The World Health Organisation (WHO) said today that France had 4,937 reported cases of measles between January and March — compared with 5,090 cases during all of 2010. In all, more than 6,500 cases have been reported in 33 European nations. “This is a lot of cases, to put it mildly. In past years we’ve had very few cases,” said Rebecca Martin, head of WHO’s office in Copenhagen for vaccine-preventable diseases and immunisation. WHO has found that young people between 10 and 19 have not been getting immunised as they should, she said. To prevent measles outbreaks, officials need to vaccinate about 90 percent of the population. But vaccination rates across Europe have been patchy in recent years and have never fully recovered from a discredited 1998 British study linking the vaccine for measles, mumps and rubella to autism. Parents abandoned the vaccine in droves and vaccination rates for parts of the UK dropped to about 50 per cent. The disease has become so widespread in Europe in recent years that travelers have occasionally exported the disease to the US and Africa. Around Europe, Spain reported more than 600 cases in Andalusia in two outbreaks since October in Sevilla and Granada. Macedonia reported 400 cases this year with the capital, Skopje, most affected. WHO said outbreaks and rising case numbers also were reported in Britain, Germany, the Netherlands, Norway, Romania, Russia and Switzerland. WHO officials are examining immunisation coverage data and plan a workshop with French, German, Belgian and Swiss officials later this month. Measles symptoms include fever, cough, spots on the cheek and a rash. It is spread through close contact including coughing and sneezing and is especially serious in babies and people with weak immune systems. Health officials estimate complications affect one in every 15 children infected, including pneumonia, seizures and encephalitis. Email “WHO blames Europe's measles outbreak on vaccination levels”. Feedback on “WHO blames Europe's measles outbreak on vaccination levels”.